Last year UNAIDS announced that the milestone of 15 million people on anti-retroviral treatment (ART) globally had been reached. But only one-third of children living with HIV are diagnosed and put on treatment. Faith-based organisations form a vast grassroots network and are a vital source of care for children and mothers living with HIV. Caritas has joined efforts with UNAIDS, the U.S. President’s Plan for AIDS Relief (PEPFAR) and the Vatican’s Paediatric Hospital Bambin Gesù to provide faith-based organisations the opportunity to discuss their past successes and challenges as well as their potential for better diagnosis and treatment of children living with HIV. 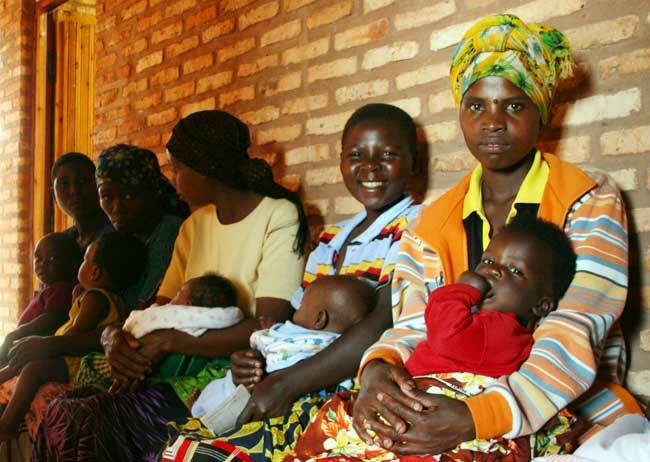 Epiphanie and Josiane in northern Rwanda are both HIV positive, but thanks to prophylaxis treatment provided through the AIDSRelief consortium, their children are virus-free. Photo by Helen Blakesley/CRS. Who: Cardinal John Onaiyekan, Archbishop of Abuja, Nigeria; Dr. Luiz Loures, Deputy Director for Programmes, UNAIDS; H.E. Ambassador Deborah Birx – Global AIDS Coordinator and Director of PEPFAR, scientists and advocates committed to expanding treatment access for children; plus representatives of both national and local Catholic-inspired, ecumenical, and inter-faith organisations engaged in HIV care; persons living with HIV. Journalists are invited to attend the closing plenary on 13th April from 5-6.30pm with participants and guests from diplomatic corps accredited to the Holy See and from the press corps. For further information or to arrange individual interviews with participants during the conference please contact Michelle Hough +39 06 6987 9712/+39 334 234 4136 hough@caritas.va.